Ronald Tippet’s friends all call him a “foodie nut.” He considers it a compliment. “It’s a lot of fun — I just really love cooking,” he said. This month, the long-time Ably Insurance agent put his hobby to work on a new career. He opened Grand Slam, a food truck serving breakfast and lunch seven days at a week in the Delaware County town of Stamford. The simple menu includes three lunch options for just $5: cheeseburgers, pulled pork sandwiches and breaded pork tenderloin sandwiches, each with fries and a drink. Breakfast items include egg and cheese on a hard roll with coffee for just $3; bacon is $1 extra. Waffles are also $3. “The whole goal was to be really, really reasonable so that a family of four could afford to eat without breaking the bank,” said Tippet, who lives in Harpersfield and has run the Ably Insurance Co. on Main Street for 13 years. Grand Slam’s french fries are made from actual potatoes that are cut to order, not frozen, and come in a spiral version. As he enters his third week in business, Tippet is adding soups and grilled cheese sandwiches, as well as sausage and gravy over biscuits for breakfast. The food truck will operate through the winter while Tippet develops an even bigger idea: converting the existing 4,000-square-foot building he owns at 10 Harper St., where the truck is now parked, into an independent fast-food restaurant, also called Grand Slam. It will have a similar menu of burgers and sandwiches, along with soft-serve ice cream. It will offer drive-through service as well as indoor seating for about 30 people, and an “old-fashioned soda jerk” vibe, he said. “This area can really use something like that,” Tippet said. Grand Slam is the second new business to open on that stretch of Stamford’s main drag this year; 13 Harper coffee shop and bakery launched right across the street this summer. 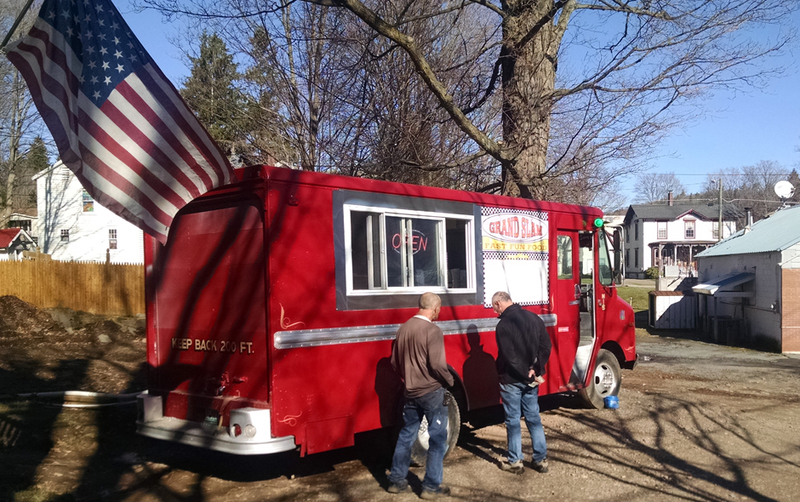 Find Grand Slam food truck at 10 Harper St., Stamford, from 7 a.m. to 4 p.m. daily. The phone number is 607-222-4337.